The Redemptorists » St. Alphonsus Liguori, pray for us! On August 1, Redemptorists around the world celebrate the feast of our founder, St. Alphonsus Liguori — priest, confessor, bishop, and patron of arthritics. The oldest son of a prominent naval officer in Naples, Italy, he founded the Congregation of the Most Holy Redeemer in 1732. Since he preached his first mission to the goat herders in the countryside around Naples, the missionary family he founded has spread throughout the world. 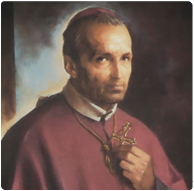 St. Alphonsus died on this date in 1787 at the age of 91. He is the patron of moral theologians, as well as the patron of those suffering from arthritis, a condition that confined him to a wheelchair for much of his later years. We hope you’ll join us in thanking God for the life of St. Alphonsus, and pray that more young men will join us in following him in the footsteps of Our Redeemer. St. Alphonsus, you are the special patron of all who suffer from arthritis and the pains of many years. When our fingers twist with pain, keep us focused on the hands of Christ pierced with nails. When our knees throb with endless aches, allow us to see the knees of Jesus smashing to the street under the heavy cross. When our backs stiffen with soreness, let us remember the back of Christ thrown across the rough wood of the cross. When our hips, elbows, knuckles, and other joints hurt so much that tears well up in our eyes, help us to recall the tears, the sweat, and the blood that flowed from our crucified Jesus, who suffered so much more for each of us. St. Alphonsus, you were afflicted with curvature of the spine and confined to a wheelchair in your final years. Teach us to unite all our pains with the sufferings of Jesus. By your intercession, may our pain be eased — but even more, may we be one with Jesus in his death and resurrection for the redemption of the world. Amen.